the DogBlog for Rags the Working Cocker Spaniel - chief helper at Acorn Marketing and Stud Dog extraordinaire. I feed Rags on a good quality dried complete food, depending on how rich I feel depends on which brand I get. I supplement the kibble with fresh meat - which I slow cook overnight with circa 3 pints water to 2kg meat. Once cooled I put the liquid and meat in old takeaway containers and freeze. This way I can use one container at a time so everything lasts longer - each box lasts Rags about 3 days and I know it's free from additives. Plus the juice turns to jelly once its put in the fridge and he likes a bit of something wet with the dry kibble. He is best on 2 meals a day - breakfast after walk one, and then supper after walk three. I tried him on just one meal a day and he really didn't take to it at all and struggled to eat the same quantity in just one sitting. Because he doesn't solely eat dry food which supposedly helps keep their teeth clean, I brush his teeth about twice a week. I get Aloe Vera toothgel which he loves and which the vet recommended as great for dogs. In fact, I use lots of Aloe products on Rags and they are great - the shampoo is gentle and the drinking gel is good for arthritis and joint problems. They use Aloe products at Longleat Zoo and lots of equestrian places swear by it! Another useful thing I use on Rags is Aloe Gelly - if he scratches himself on thorns or gets little wounds, I put the gelly onto it to keep it free from infection. I also put it on when I have removed a tick, again to keep it clean. My friends dog had a skin disorder on its ear and she tried everything to get it to clear up - finally she tried the Gelly and voila! all gone and not come back. Another tip is the homeopathic 'Silicea' which is great for drawing thorns out of paws etc - it is harmless to the dog and really works - one tablet every 12 hours for a couple of days usually does the trick. Rags is a devil for pulling on the lead - and he will throttle himself until his eyes go red rather than stop pulling. Normally he is exercised off lead so it's not a problem, but sometimes he needs to be on a lead, and it's uncomfotable for both of us. I have got him a halter thingy for in the car, which goes around his body and shoulders and can then be attached to a seatbelt - I now use this for lead walking, and just attach it to the lead instead. He doesn't pull so much and he doesn't throttle himself - much better for everyone! Another tip I learnt was that if you are planning to actually work your Working Cocker, then toys which encourage tugging are a no-no. The tug games will discourage the spaniel from remaining soft mouthed - which they need to be when picking up pheasants. I can give Rags an unbroken egg and he will very gently carry it around the house and then equally gently replace it unbroken in your hand - great party trick and encourages the soft mouth! 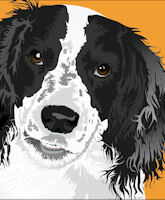 There are some really great training videos available from The Dogs Trust which may come in handy too.